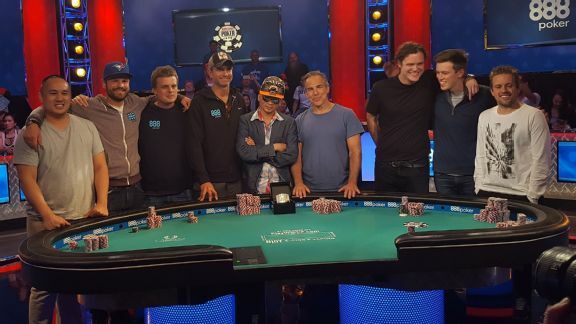 Tim Fiorvanti/ESPN The nine players who made the 2016 World Series of Poker main event final table -- the November Nine -- pose shortly after reaching one of the most sought-after milestones in poker. 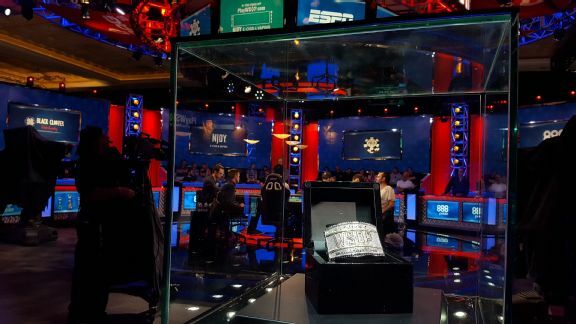 The most prolific poker tournament in the world has hit its final table, with the nine remaining players in the 2016 World Series of Poker locked into a $1 million prize guarantee and a long layoff before they complete the event in late October and early November. Josephy is the only player among the final nine who has won a WSOP bracelet before (he has two), but his opponents have a long list of accomplishments on other major poker tours and in the world of online poker. "The experience was fantastic," Josephy said of his run to the final table. "For me to cruise along and not hit any speed bumps -- I didn't even lose a medium-sized pot today! It's really unheard of." While it will be his first appearance on the Penn & Teller Theater stage, it won't be his first time up there. Josephy had a prolific effect on the poker industry as a whole as one of the most prominent and successful financial backers in the game. "I've experienced this a few times," Josephy said. "I was in that audience the first two years of the November Nine, with Ylon Schwartz in 2008 and then Joe Cada in 2009. I will know what to expect, and it will not intimidate me one iota." Joining Josephy in a tier ahead of the other seven players is Qui Nguyen, a Las Vegas local whose previous-best cash in a poker tournament amounted to less than he paid to enter the main event. Gordon Vayo, a 27-year-old from San Francisco, has a runner-up finish and third-place finish in previous WSOP events and sits third in the chip counts. Belgian Kenny Hallaert, who's fourth, has a history of making runs through tournament fields of tremendous size before -- he fought his way through more than 20,000 entrants to finish fifth in the inaugural Colossus event in 2015. In all, five Americans (Josephy, Nguyen, Vayo, Michael Ruane and Jerry Wong), a Belgian (Hallaert), a Canadian (Griffin Benger), one Czech (Vojtech Ruzicka) and one Spaniard (Fernando Pons) make up the 2016 iteration of the November Nine. The final day of play before a three-and-a-half month break was shaping up to be a knock-down, drag-out fight. With the patented tournament structure that’s set up to allow the best players the most opportunities to rise to the top chip stacks, it seemed as if play would stretch into the wee morning hours. It ended up quite different, in fact. Although most of the field was incredibly deep-stacked for this stage of the tournament, there were enough short stacks and enough action that, except for one early stretch in the day, there was nothing but the math that pointed toward a long final day. Tim Fiorvanti/ESPN The custom World Series of Poker bracelet awaiting the champion of the 2016 main event. The first two eliminations came quickly, as both Christopher Kusha and Philip Postma were sent out in the first 10 hands of the day, but the pace slowed considerably as no further players would ultimately go out in the first level of play. Kakwan Lau scored a double elimination, dispatching Adam Krach and Antoine Saout in a dramatic hand in which his pocket aces dwarfed Krach's queens and Saout's sevens until the sevens hit on the turn. The river, however, was the ace of hearts, giving him a winning full house and reducing the field to 23. In all, only five players went down in the first four hours of play, but the pace would pick up considerably as the day rolled along. Players went out in bunches, reducing the field by two and three at a time between brief lulls. Most of the final nine who made it through to October spent time in the top spot throughout the day, highlighting just how competitive a day and competitive a field that remained at this late stage in the tournament. A particularly memorable stretch in which three players were eliminated to get down to the final 14 was kick-started by brash Englishman William Kassouf's demise. Kassouf, whose confrontational style and never-ending stream of table talk frustrated opponents and drew the kind of attention that had him at the featured TV table for the majority of the past few days, had the misfortune of running pocket kings into the pocket aces of Griffin Benger. It will almost certainly be one of the highlights of the ESPN broadcast when it airs starting in September. The final push toward the November Nine also saw Vayo pull of an unlikely comeback and surge toward the top of the counts. He entered the dinner break with 6.475 million, and by the time the night was through he had 49.375 million -- good enough for third place. A second, majorly disruptive but somewhat brief lull was caused by the two shortest stacks -- Joshua Weiss and John Cynn -- stalling the action in an attempt to advance further in the tournament without taking the risk or the cost of playing more hands. Tournament director Jack Effel stepped in and declared that tournament staff would have the power to put any player deemed to be taking an excessive amount of time for a decision on a clock. It didn’t take much longer for the Day 7 action to roll to its conclusion. Cynn’s queen-10 fell to Vayo’s ace-king, with both players making two pair, and Cynn's elimination in 11th brought the field down to a single table of 10. Weiss had the shortest chip stack by a wide margin, and the blinds and antes further deteriorated his position. With each fold, his likelihood of comeback became smaller and smaller, until he moved all-in in a spot where both Ruane and Vayo had to call his bet from the blinds. Ruane and Vayo quickly checked it down on a Js 7h 3h 5c 4c board, and then the three hands were tabled; Ad 8c for Weiss, Qh 7s for Vayo and Jd 5h for Ruane. With two pair, Ruane’s hand was good enough to eliminate Weiss and make the final nine players certified millionaires. This group is the ninth iteration of a concept originated in 2008, where the final table is put on hold from July through late October or early November. Pre-filmed episodes of the show will air chronologically through the week before the actual final table, at which time three days of live coverage from Las Vegas will air on ESPN networks around the world.